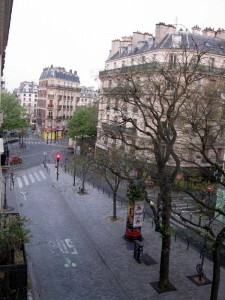 Back from Paris, still unpacking and doing laundry. Yesterday it was disconcerting that everyone in the grocery store spoke English and today I keep patting at my pockets, missing the familiar shape of our passports. By tomorrow most of the “re-entry syndrome” will have worn off. Until then, I have pictures. 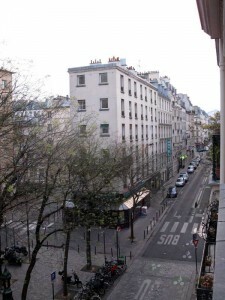 We lived out our week at #40 Rue Jean Pierre Timbaud. It’s a nice, normal neighborhood with lots of motor scooters and old men arguing on the corner. 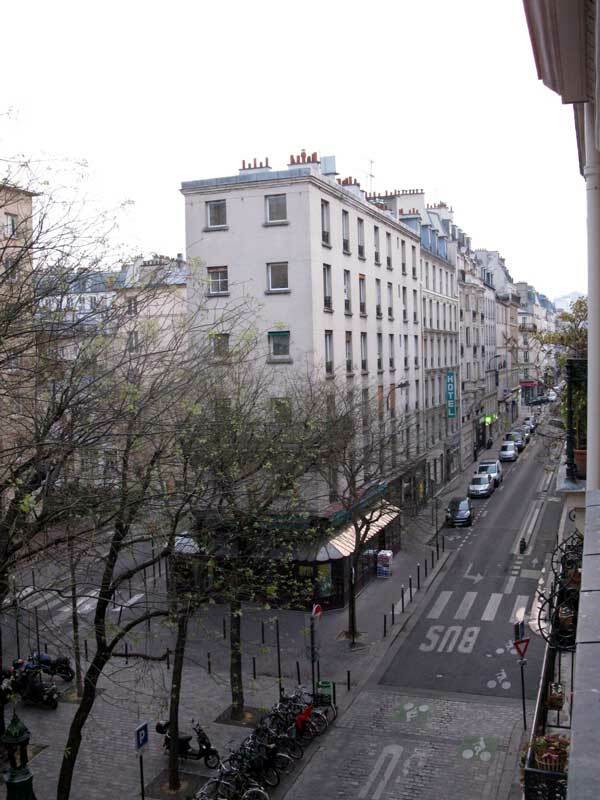 Our block had a pharmacy, a “tabac”, a bar with good food, a five-star restaurant, a take-out place, a smarmy pizza joint, and a motorcycle dealership. Yeah, we could have lived there. No problem. Lunch in our tres tiny apartment: quiche a la legumes, “jambon” sandwich, apricot tart and the ubiquitous bottle of vin ordinaire. Looking out the window eastward on an overcast morning. The awnings on the “v” belong to Les P’tites Indecises, a wonderful little restaurant where we translated a menu item as “crunchy chicken tandoori”. I had to try it – turned out to be chicken tandoori as a fried spring roll. It was incredible. Looking toward the west. . .Curious about how many apartments in that building? Count up the chimney flues. Next post – dinner at Astier, just underneath this window. 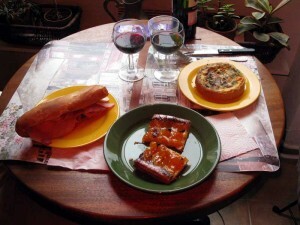 This entry was posted in Paris, Travel and tagged cityscape, indian cuisine on April 17, 2012 by APo.